There is nothing more rewarding about being on the road than being able to bring your family with you. A couple of weeks ago it was spring break in Texas and we decided this year we would make the most of all of those miles & points. Over seven days my family and I took planes, trains, UBERs, Metros, subways and did a lot of walking through both Washington, D.C. and NYC. There is also no better way to see how neurotic you have become about traveling than by traveling with a group of people who don’t travel every week. Evidently I travel a bit “differently”. There is nowhere this is more apparent than in a hotel room. I am the kind of traveler who unpacks the same way, as soon as I get in the hotel room, EVERY TIME!! I do exactly the opposite as soon as I wake up on the last day of my residency at said hotel. To say that my 13 and 15 year old do not follow the same dedication to order would be unwarranted to say the least. We were lucky just to find all of their clothes let alone actually have any of them actually reside in a drawer, on a hanger or even in the suitcase that brought them to the destination. Makes you wonder what the lost and found at a Disney resort must look like!! Working out while traveling with family is hard!! And this is from someone whose spouse is dedicated to fitness and health as well. Over the course of the 7 days, I got a grand total of one real workout in (granted, we did average walking over 5 miles a day in these wonderful cities). When I am on the road alone, I have no problem working out late at night or delaying dinner until after a run. It is a must attend event for me, I have recently even found a way to make this happen on The Dreaded Day Trip but for some strange reason, my family actually likes to eat on a regular schedule. Eating at a normal meal time? Huh, who would have figured? Might have to try that sometime. I have a few rules around when I travel. They are the core of my routine when it comes to staying fit while on the road and you can read all about it here . With the exception of ‘See Fruit – Eat Fruit’, I gladly broke every single rule I have made for myself on this trip. One thing I realized is that the rules are selfish when you are traveling with family. They are (purposefully) self-centered because when you are on the road alone or for work, you can afford to be self-centered. In fact I can make a strong argument that YOU SHOULD BE SELF CENTERED ON THESE TRIPS!! When you are on the road with family though, it is time to be others-centered. We had a couple of great meals that normally would not be RoadWarriorFit approved. New York pizza slices, sandwiches from chains you can have anywhere, even burgers and fries at The Harlem Shake. 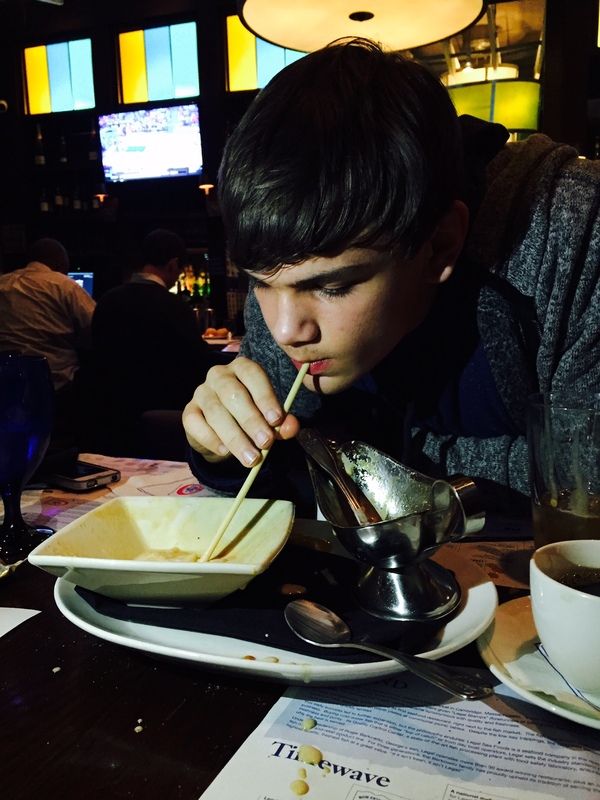 For example, let your child drink the melted ice cream and caramel sauce with a straw!! OH MY GOD…you have to try this place. 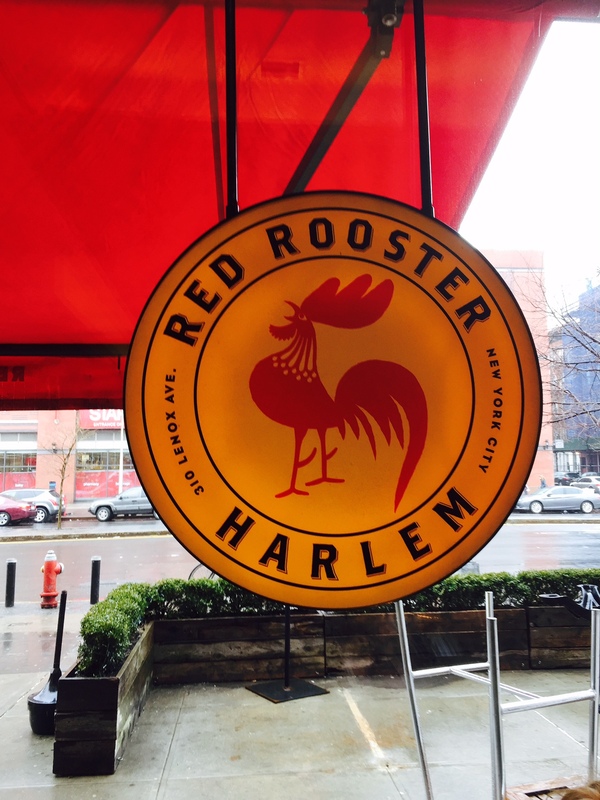 Martin Samuelson has completely outdone himself with this new Harlem mainstay. My point here though is not to give you a glowing restaurant recommendation but rather that the experience was the important part. I got to share a phenomenal brunch with the most important people in my life. It was an experience we could not have had at home (and the chocolate French Toast is to die for). The biggest lesson learned on the trip? Traveling with others is better than traveling alone. Even though I was not able to enter or exit a room in less than 2 minutes or get a work out in every day or avoided all fried food, the experiences and memories we were able to develop as a family were worth it all. 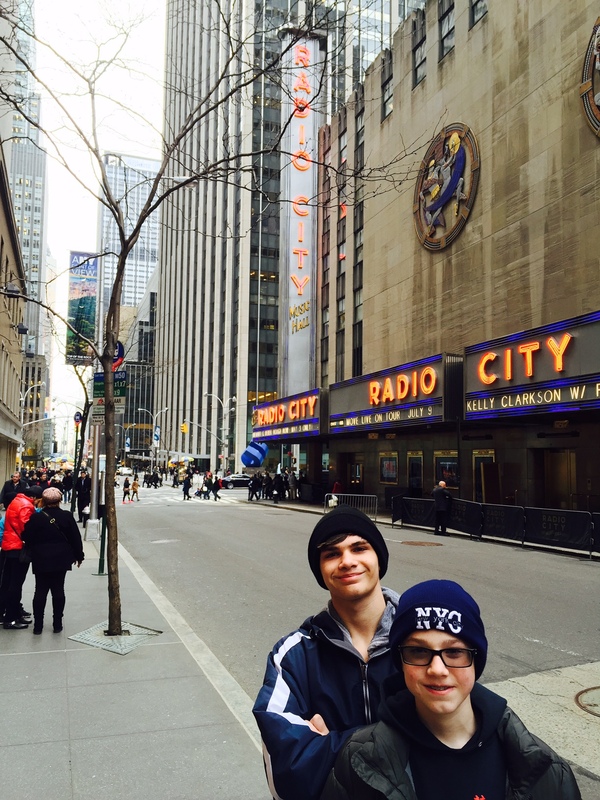 I saw my boys marvel at the NYC skyline, I saw them humbled by the National Mall and astonished at the atrocities of the Holocaust. Yeah, it was a good trip. Now it is back to the grind and following a bunch of rules. See you on the road. So it is the second week of the year. The holidays are over, vacations are complete, the airports are becoming sane again and being resolute in the commitments we made over the new year may be becoming a bit harder than we expected. 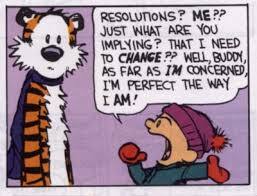 Making resolutions always seems really easy, being resolute is another story entirely. If you are like most Americans, your resolutions centered around 1) health 2) money and/or 3) relationships. So as a RoadWarrior, how do we ensure that our resolutions become habit? You decide in advance what you will and won’t do and we only make decisions once. The problem with most ‘resolutions’ is they are focused on the end results and are not date specific. In order to achieve them, we need to focus on the steps that will get us there, this is where the RoadWarrior Rules come in to play. Let’s hypothetically say your resolution was to lose 10 – 15 lbs. The first thing you need to do is to set a date. When are you going to lose this weight by? Don’ just ‘Begin with the End in Mind’, clearly define when is the End arriving? A date is what moves a resolution to a goal (we’ll talk about moving the goal to a lifestyle later). Do something….anything….every day!!! – I really don’t care what it is. Run, lift, do Pilates, hit up a Beachbody DVD, walk the local mall/tourist attraction or train at a local martial arts studio. Heck, I have been known to run on the treadmill in the Admirals Club and have been caught running stairs in the airport. If you are doing more than a day trip, you need to be doing something active. If you see fruit, eat it – Often times when you check in to your hotel, there are apples on the counter. Or in the gym, there is a basket of fruit. Or in the airport gift shop, there is a refrigerator with various fruit options. Pretty simple rule, see it….eat it. Don’t eat anything fried – For the most part I avoid anything fried while on the road (there is a wonderful place in Fort Lauderdale that has lobster corndogs that I make an exception for though…unbelievably good and you can check them out at coconutsfortlauderdale.com). What this also means is I do not do ‘cheat meals’ on the road as my cheat meal usually involves something fried. Those are saved for being at home with the family where we can enjoy it together. Workout first, then you can have wine – I love red wine. I believe there is a reason that Jesus’ first miracle was turning water into wine… just sayin’. However, my rule on the road is I will not have wine (or any other alcohol) if I have not had a workout first. Don’t eat in any restaurant you could eat at at home – The restaurants you find at home and on the road are chains. They are all about systems and duplication. Nothing necessarily wrong with that but I want quality and nutrition. Ask the front desk or Yelp/Google/Urban Spoon about whom to go eat with. Every region of the country has a specialty that when prepared right is fantastic tasting and fantastic for you. Being resolute is a matter of being prepared more than disciplined. Preparation allows you to avoid areas of temptation and put the actions that lead to success first. These are my rules regarding healthy living on the road. Start with your goal and set up the rules that will lead you to success in savings, improving your relationship, spending more time with you kids, whatever. Be resolute. Be better in 2015. There is a great message out there by Andy Stanley from Northpoint Church in Atlanta (watch it here http://www.youtube.com/watch?v=zt5tkQS7K4Q or buy his book here http://www.amazon.com/Guardrails-DVD-Avoiding-Regrets-Your/dp/0310893984). In this message Andy talks about guardrails. You know, the ones that keep you from running your car off of that bridge and/or cliff. Pretty simple design actually, put posts that are really thick, buried deep enough down to withstand a serious impact and then attach a solid steal rail to them. So even if the worst happens, you should be able to stay on the road rather than ending up in the ditch or off the cliff. If you spend any time at all on the road, you have to install guardrails in your travel life. While I have put guardrails up around my mind, spirit and most importantly, my relationships, for this post I am going to focus on those I have installed around my physical fitness. I’m not implying that you need to have the same guardrails as I do but you do need to have your own guardrails. 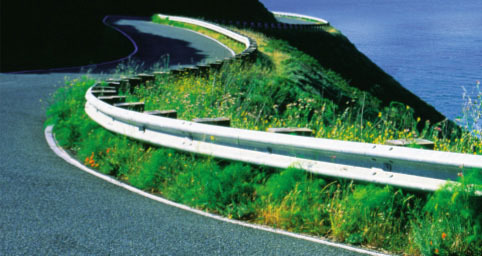 Below are the guardrails I have in my own Road Warrior journey. They have served me well for the past 5 years and I hope that they can inspire you to put your own in place. I will expand on each in later posts but here are the basics. Don’t eat anything fried – For the most part I avoid anything fried while on the road (there is a wonderful place in Fort Lauderdale that has lobster corndogs that I make an exception for though…unbelievably good and you can check them out at http://www.coconutsfortlauderdale.com). What this also means is I do not do ‘cheat meals’ on the road as my cheat meal usually involves something fried. Those are saved for being at home with the family where we can enjoy it together. So there it is folks, my 5 Guardrails when it comes to physical fitness on the road. What are the rules you live by, either on the road or at home? Any I am missing? Looking forward to your input as we travel this road together.